Hydrogen Annealing should always be the final step in the manufacturing process, as any shock or vibration to the shield after annealing will degrade the material’s performance. Our three in-house annealing furnaces are computer controlled and monitored daily to maintain consistent performance. 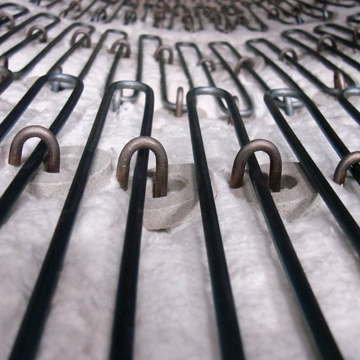 Our standard annealing cycle conforms to MIL-N-14411C and occurs in a dry hydrogen atmosphere with a dew point below -60°F, heated to 2,150°F (1,177°C) and held for four hours. We then cool each shield to room temperature at a specific cooling rate that depends on the material and the final shielding application. With high nickel content shielding alloys, Hydrogen Annealing removes impurities such as Carbon, Sulphur, and other trace elements from the material and relieves the mechanical stresses due to processing and fabrication. The Hydrogen Annealing process enables growth of the Nickel’s crystalline structure and reduces stress at the grain boundaries. This newly formed Nickel structure increases the material’s permeability and performance, and creates an extremely low reluctance path for magnetic fields to follow. After the annealing cycle, materials must be handled with care. They are extremely sensitive to shock, vibration, and stress. The newly formed crystalline grain structure of Nickel is relatively fragile and any disturbance will begin to destroy the material’s effective permeability.